Whether you are a compulsive Twitterer or someone who thinks the idea of posting random single sentences is a bit naff, there is one reason going down right now on the internet phenomenon that everyone needs to read and/or take part in. #ComicsDidAGoodThing. Former Wonder Woman super-scribe, Gail Simone started the tag as a way to collect all the different positive ways, roles and influences, comics have played in the lives of folks just like you and me. For myself, #ComicsDidAGoodThing by proving how imagination never ages. They made me laugh and 'wow', and while comics inspired me to write and draw, Superman inspired me to be the best me I can become. The upbeat optimism of heroes like The Thing, also showed me in the darkest moments I have lived through so far, that the truest hero you'll ever know is the one inside yourself. Some of the best entries I've read are below, but I recommend you read them all in full right over here. I don't do twitter, so I'll just leave this here. Comics taught me that friends can be made from the strangest groups of people, and those friendships can last a lifetime. And even if you disagree with them, you can still love them with all of your heart. Oh! And it taught me some Russian, too. Thanks Random! 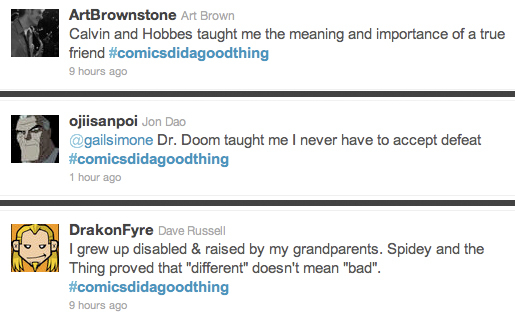 You're completely right and Comics helped teach me languages too. Namely American. 'Mom' instead of 'Mum', 'Color' instead of 'Colour' etc - it's hard to learn spelling when your main reading material is setting you up for a B-! The other thing I'll ad to that is comics were an adult that didn't talk down to you. Spider-Man was broke, Tony Stark drank like a fish, Henry Pym bashed his wife, Terra turned against her friends, and the Human Torch stole his best mates girlfriend. Who needs CSI when you can read this sort of stuff! i don't do twitter either. but following characters like Bronze Tiger and Deadshot who take on meta-powered characters has given me a sense of delusional invincibility much like a cocaine high. hence my videos in the streets of San Francisco as a pro-Israel advocate. And Dave who doesn't want to be like Bronze Tiger (with or without headgear)? Still if comics are about anything it's standing up for your beliefs.